I'm so behind on my blogging that I haven't had a chance to let you all know that I was nominated for another award - The Sunshine Award - by the very talented Juliette Chapman. Recognition is such an encouragement - and comes in all sorts of ways. These awards are lovely as they are from your fellow bloggers, but I value your comments too - so feel free to leave them for me. They really do put a smile on my face. 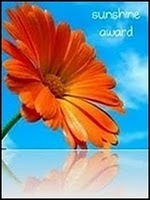 Put the Sunshine Award on your blog or in your post. Let them know they have received the award by leaving a comment on one of their posts. Don't forget to share with the person who gave you the award. I could go on and on... but I'd be repeating myself again and again. There are so many talented stampers out there & I'm inspired everyday by their work. If you follow a blog that you love, can I encourage you to comment. Leave some words of praise & encouragement. It's the biggest thrill when someone acknowledges your efforts. That's it for today. Tonight is the first night I've had off in a while, but I'm hoping to get at least one more blog post done for you this week. Thank you sally. I really appreciate the award.